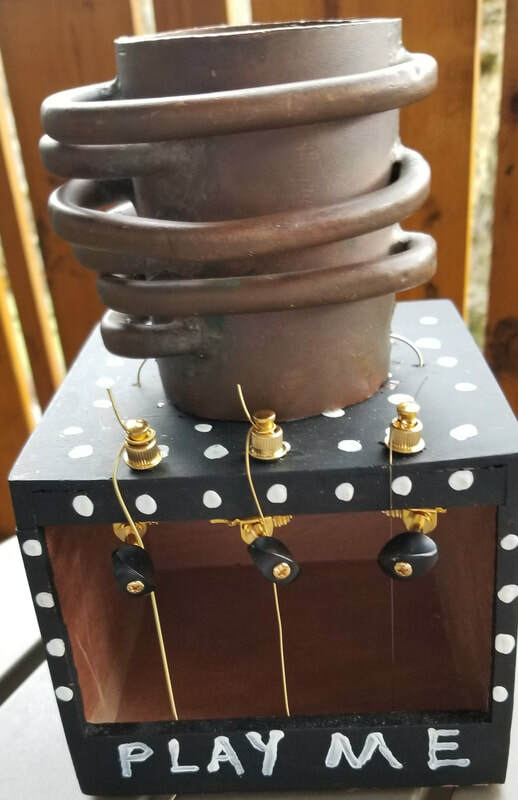 Stephen saves his used guitar strings, and uses them, with copper, bronze, brass, wood, recycled materials, and found objects, to create visual art, some of it playable, some of it wearable. 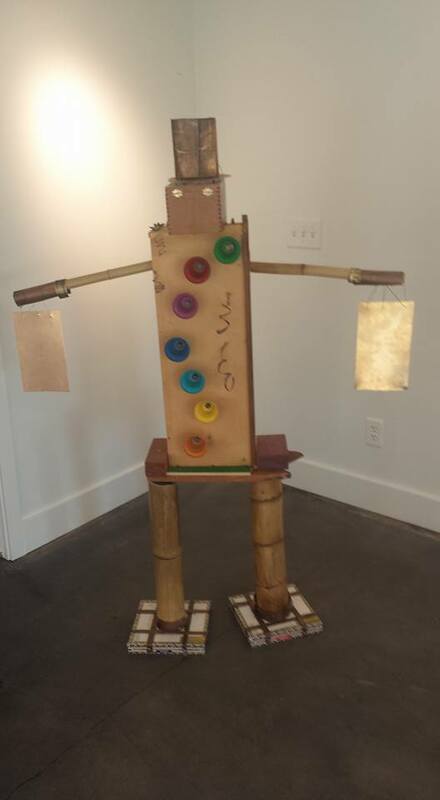 Case in point is The String KIng, a musical, playable 5 foot high sculpture, a piece that unites Stephen's musical and artistic interests. 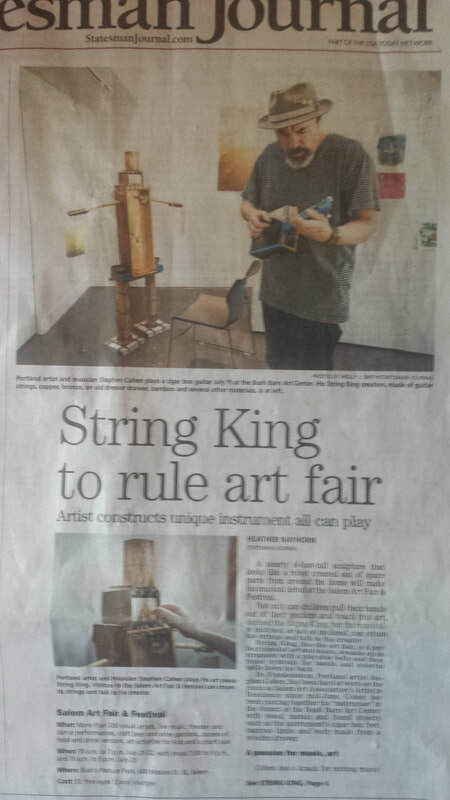 Above: Salem Statesman Journal front page article about Stephen's String King sculpture/instrument creation. 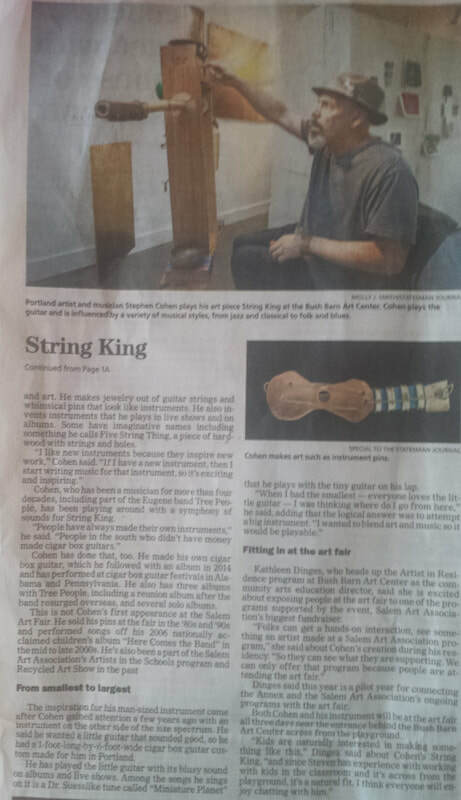 ​Below: Stephen's musical, playable sculptural instrument, The String King, which he created as a Salem Art Association Artist in Residence. hear Brother Stephen and Sister Seven Strings. They are all part of Stephen's growing Family of Sculptures. The String King now has company! 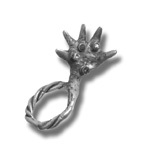 Stephen created his 3 handed instrument pin at a jewelry and metal class while attending the University of Oregon in 1981. He knew he was on to something when classmates starting purchasing his work before it even left the studio. 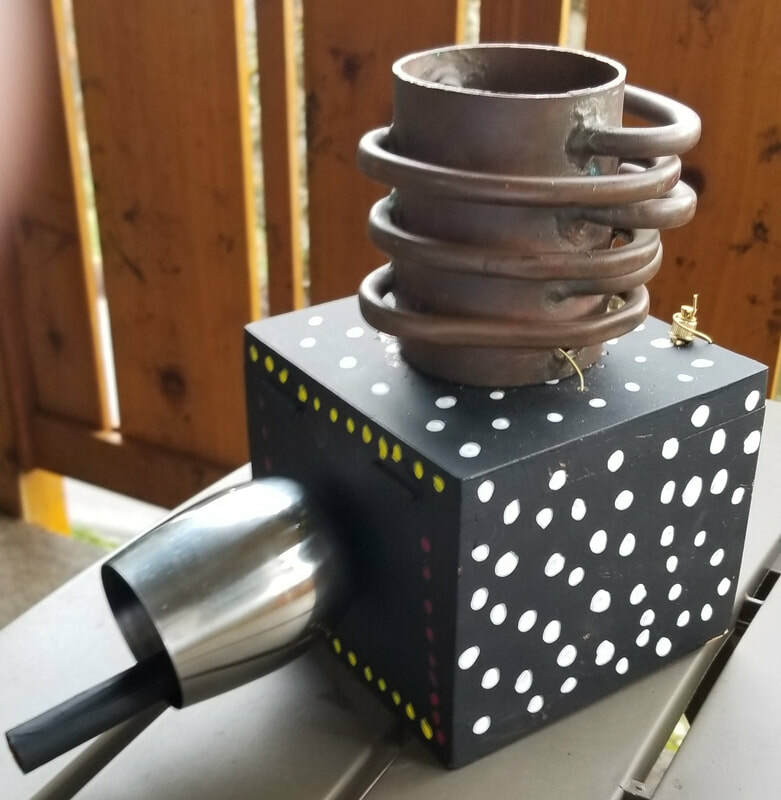 This led to him exhibiting and selling his jewelry at galleries and art fairs in Oregon and California. 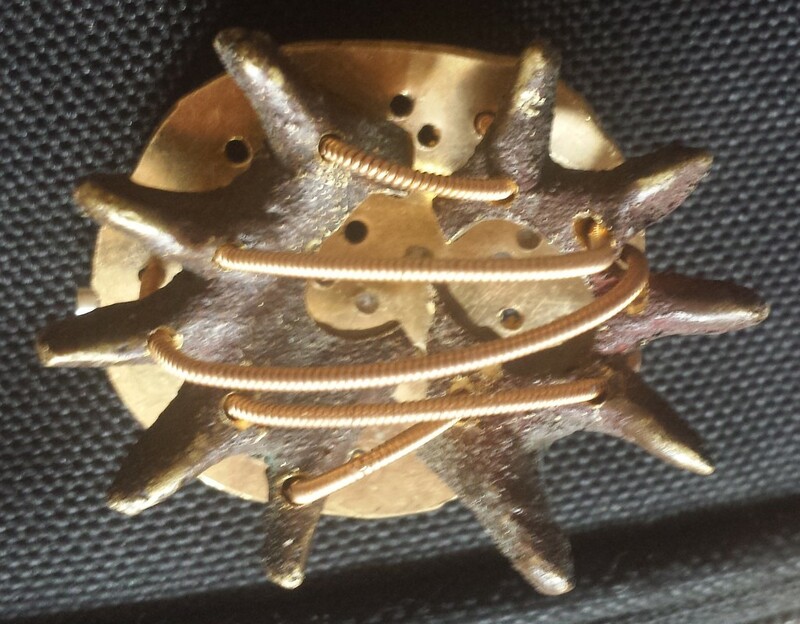 Since the he has continued to create visual art, including original, playable sculptures that are making the festival circuit, as well as unique jewelry pieces on musical themes, using copper, brass, brass, bronze, and guitar strings, and now, a new line of unique "Star of David" pins he is now making available to the public. video above: Stephen composed Garden of Bees in a studio overlooking the bees, performed it in concert in Belgium, then recorded it and created the video back home in Portland. 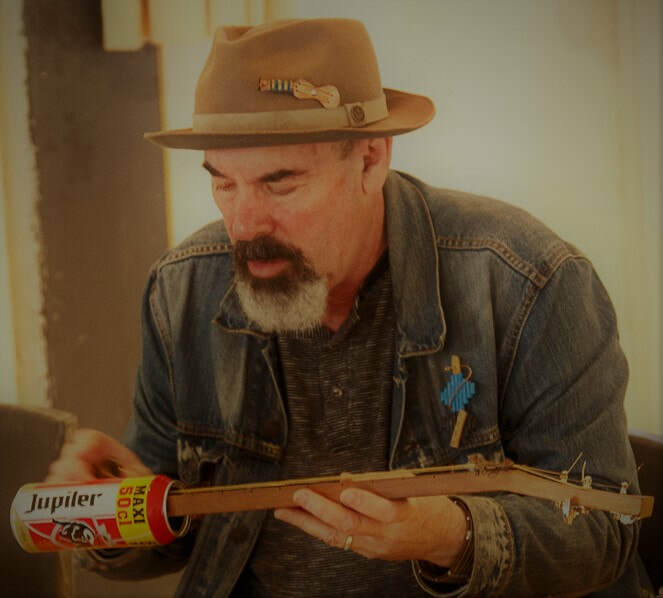 Stephen created this 3 stringed beer-can guitar as a deFENIKS Artist in Residence in Antwerp, Belgium, using a can from a local Belgium beer. Stephen drew a rough sketch of a guitar string bracelet, then commissioned metal-smith Kristin Shiga, who drew the more detailed sketch and created the beautiful bracelet that Stephen featured on the cover on his 2012 Walking Willows album, fittingly titled "by hand". After Stephen moved to the Lake Oswego hills from SE Portland, he noticed a key on his key chain that fit no lock. 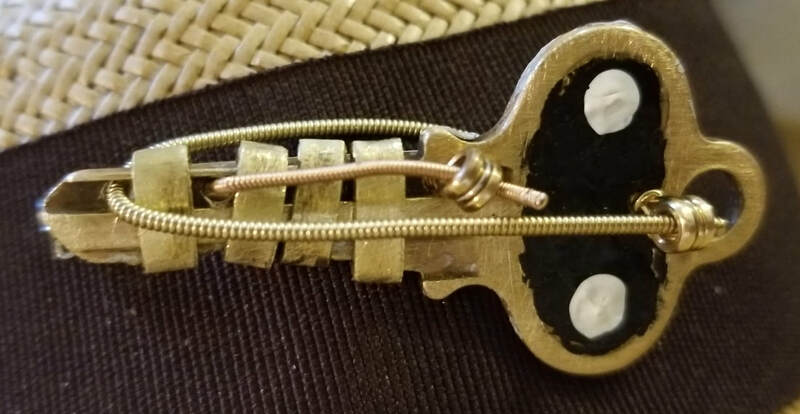 So what else could he do, but create the "2 String Key" pin, using the mystery key, guitar strings, brass and acrylics, and put it on a summer hat? 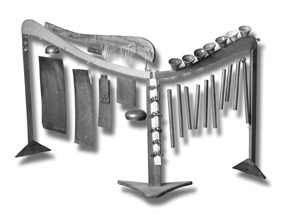 Stephen's "Sculptural Percussion" instrument, made to be played simultaneously with guitar. "All-Star Guitar" is a small sculpture Stephen created using a converse sneaker, bronze, silver and guitar strings. This photo is on the cover of his album "real life and fiction", which was made in 2000. 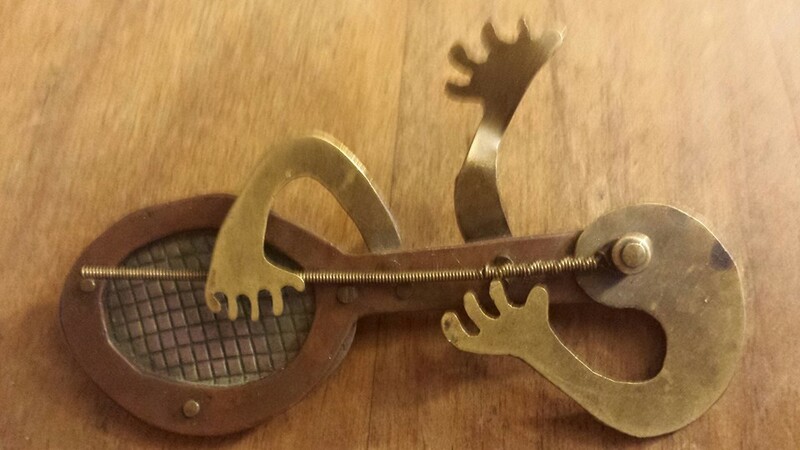 2 hand guitar string pin (2017): cut and cast brass and guitar strings. 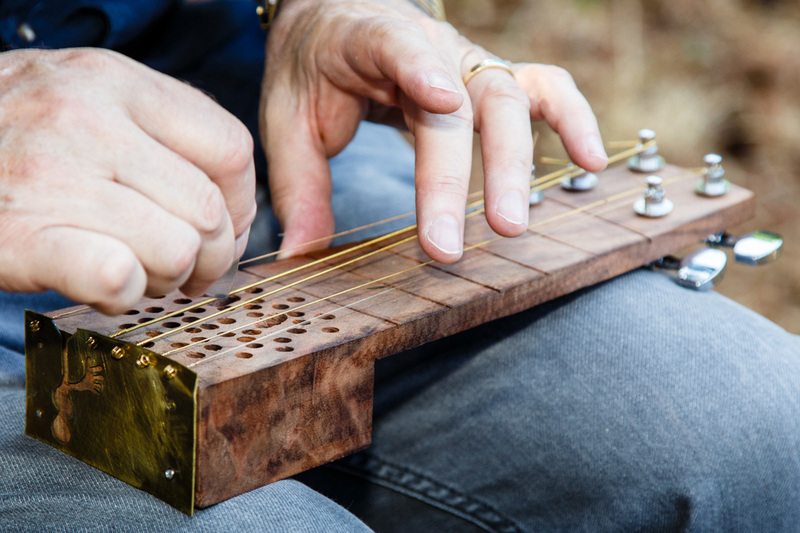 This is Stephen's "3 String Thing" instrument., which he created in 2014 out of wood, guitar strings and brass, He plays it on "Drops of Rain". Stephen cast this percussive mallet ring out of brass. 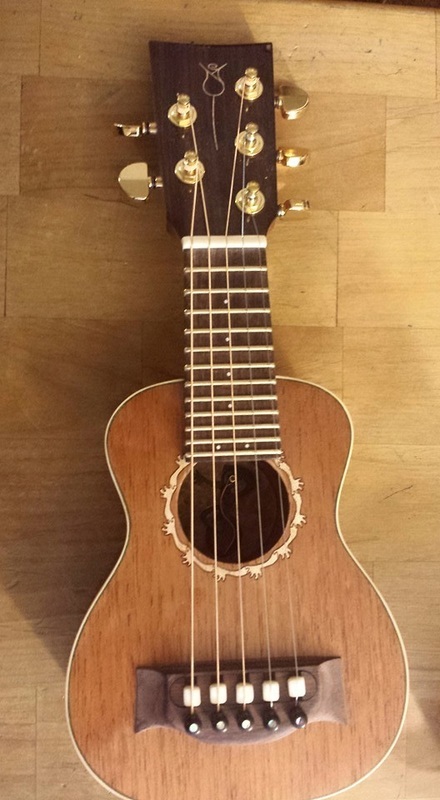 This is a custom made, one of a kind miniature guitar( just over a foot long and a half a foot wide) created especially for Stephen by Jay Dickinson of Portland Guitar. 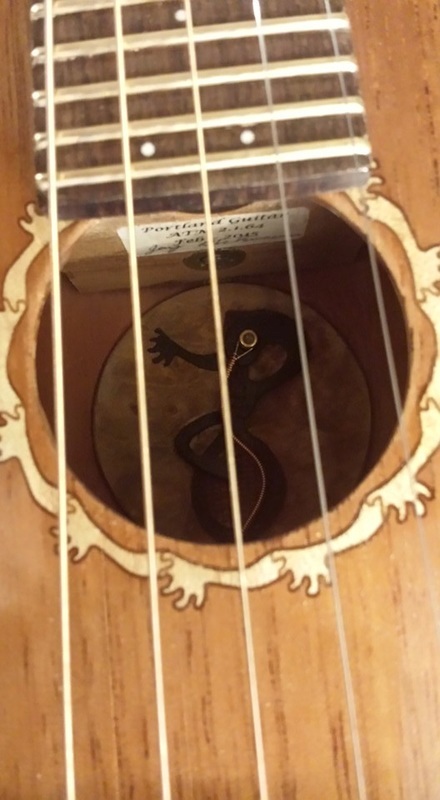 jay embellished the guitar with Stephen's drawing of hands around the sound hole and Jay's artistic version of Stephen's 3 hand instrument inside the guitar. Jay is calling this guitar his Atto Model. 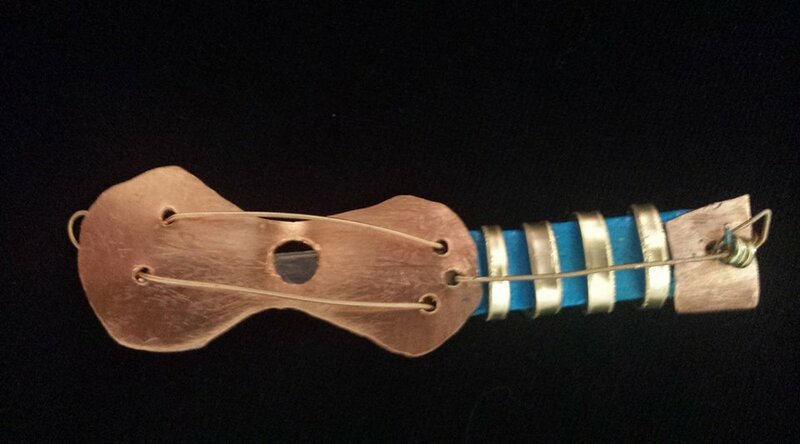 You can see Stephen's world premier of the miniature guitar in the video above. 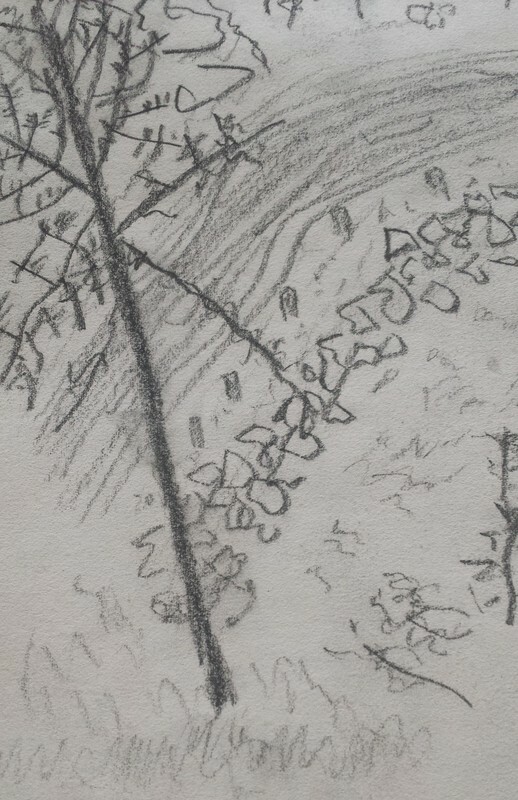 Stephen carried a sketchpad along with his guitar as he traveled west in 1971. 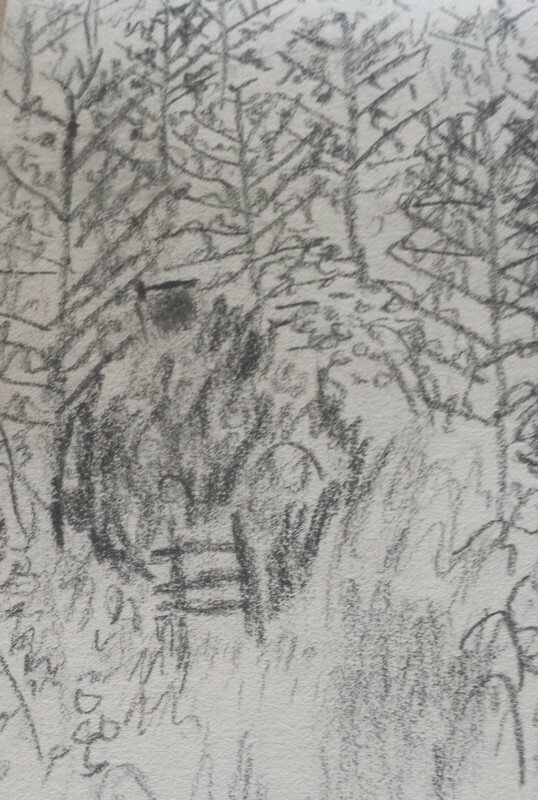 This is his sketch of the view from a tree house in northern Colorado. "I hear a stream run below" and "halfway up a hill, above an old abandoned mine" are lyrics in "We Could Live in Love", a song inspired by that experience. 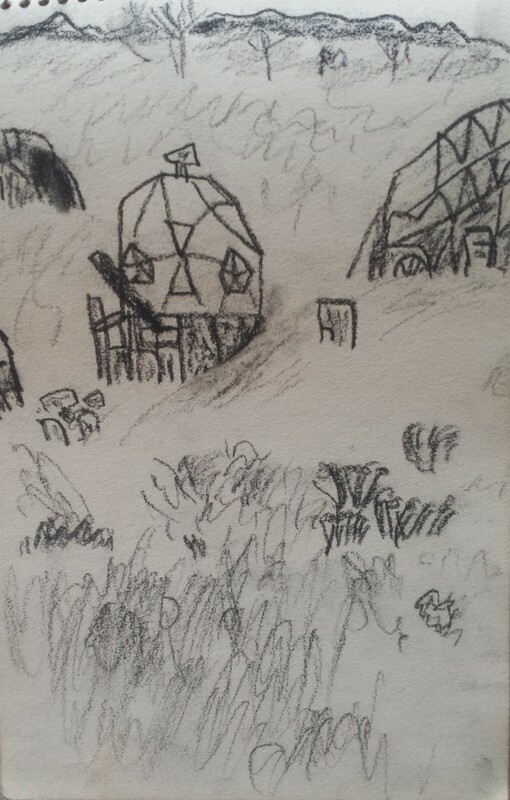 Stephen's sketch of Drop City, a commune just north of Trinidad, in southern Colorado, where he lived in a geodesic dome. Drop City and Stephen are both long gone from Trinidad. 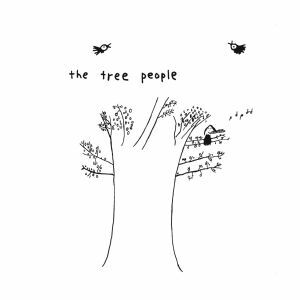 Stephen created a picture book called "The Tree People" while living in New Mexico in 1975. 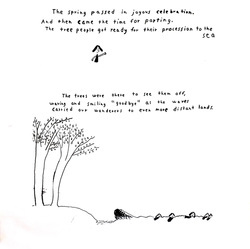 The cover, above, and the last page, below, are all that remain, but the cover drawing became the cover drawing for his first album in 1979 and the name for his first band. The vinyl album was reissued by Guerssen Records of Spain in 2008 and they used the drawing below in the insert. 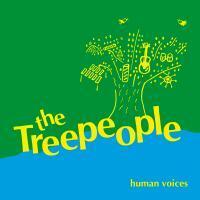 Stephen continued with the Tree People theme with the cover of the 1984 album "Human Voices" (reissued by Guerssen Records in vinyl and CD editions in 2009), with his drawing of instruments growing on trees. 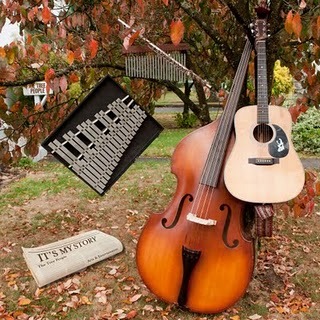 Stephen and his Tree People band-mates hung their instruments on a tree for the cover of their 2010 album, "It's My Story". Photo by Chris Leck and graphics by Redbat Design.